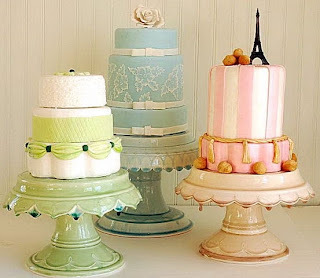 The object of my hearts desire....cake stands. 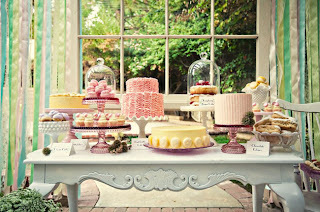 Yes, its true I absolutely love cake stands. While most girls have a collection of fabulous shoes or handbags I have a fabulous collection of cake stands. From vintage milk glass to hand painted ceramic I love them all! 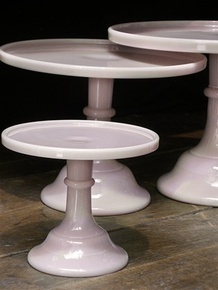 These cake stands from Clara French have been on my "wish list" for years. The sheer amount of work that is put into each one of them is unlike any other stand I have seen. They are whimsical, and a stand that you will be proud to display for a lifetime. My favorites are the Elle in Blue, Beaded Bijoux, and Pink Droplet. The best part about these stands is that you can add a custom monogram or personalized message! What a beautiful shower gift this would make. 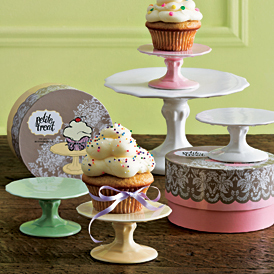 I first discovered these mini cake stand pedestals for single cupcakes at Big Sugar Bakeshop in Studio City, CA. I thought they were so cute. Wouldn't they look adorable if you had them at each persons place setting for a shower or birthday party? Alternating colors or one color would look soo adorable! If you don't live near Big Sugar Bakeshop you can order them online at origincrafts. Milk Glass is another favorite of mine. 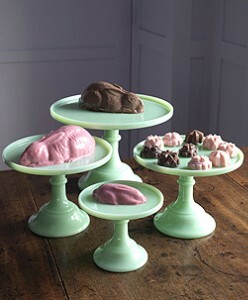 Vintage milk glass cake stands are beautiful. There are many reproductions ones now but nothing beats the original milk glass. 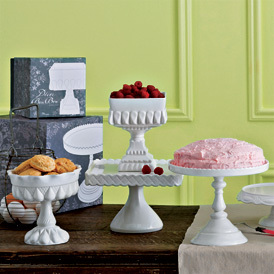 You can find milk glass cake stands on ebay, vintage stores and flea markets if you look hard enough. I love this website called sweet and saucy . 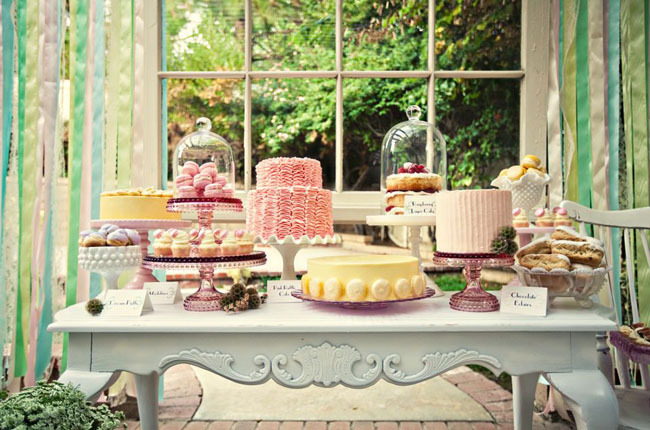 They sell beautiful cake stands, domes and other pretty baking display items. So sweet and yet so saucy :). Although some of these "decor bon bon" may not be "cake stands per se" they would make the perfect accompaniment with any cake on your table. You want to make sure your have dimension including height when you create your table display. You can buy these beauties at rosannainc. Copyright © 2011 Pretty Domestic. All rights reserved.